A fantastic tool for revenge... just kidding. This 15 3/8-inch long authentic reproduction of John Rambo's knife from Rambo - First Blood Part II features a watertight hollow handle with a cord grip that contains a survival kit, a compass built into the pommel, and guards that function as screwdrivers on both ends. 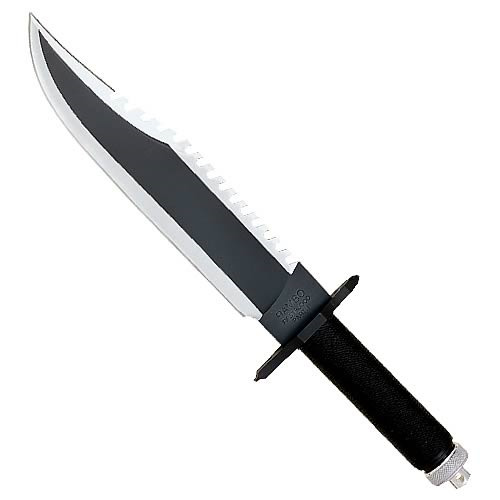 The 10-inch blade is made of 420 J2 stainless steel and comes engraved with "RAMBO FIRST BLOOD PART II" at the base. Also includes an embossed top grain leather sheath. Real knife, not a prop replica. WARNING: THE BLACK PAINT ON THE BLADE OF KNIFE TENDS TO HAVE A FEW BUBBLES AND IMPERFECTIONS. Box not guaranteed to be in mint condition.